Signature drive for "Saving Tigers in the Year of the Tiger" Campaign. The Chinese community in San Francisco is carrying out the signature drive for the "Saving Tigers in the Year of the Tiger" promotion with great enthusiasm. 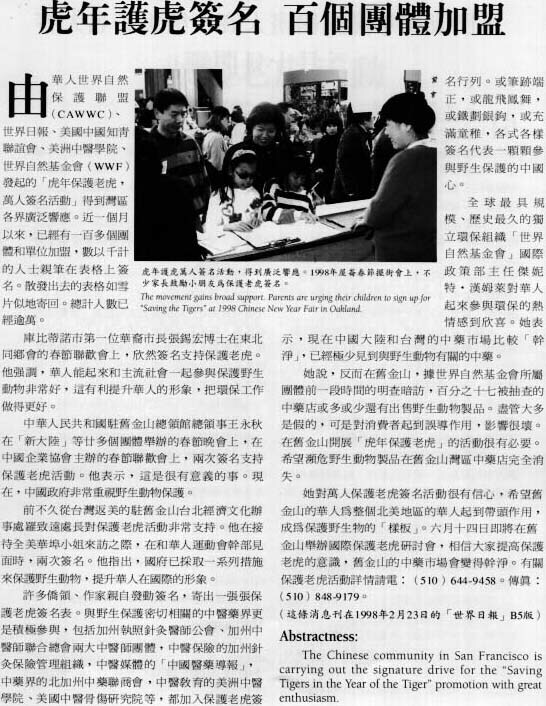 Previous article : Founding of Chinese Association for World Wildlife Conservation. Next article : The opening of the Tiger Painting Contest for Children. Brown | Teng | Workaholic | Wildlife | Let Us All | Declaration | Founding | Signature Drive | Painting Contest | SF Zoo | US Congress | Fair | Winners | Conservation | Promote | Clinton | Illegal | Support | Medicine | Dealers | Children | Shopping Bags | Events | Photos!